Documentary following the story of Pulp and the wider Sheffield music scene from around 1984 through to Pulp's success with Common People and their triumphant headlining appearance at Glastonbury in 1995. Themes covered include the miners' strike, industrial decline and the mass unemployment of the 80s; the band Chakk and the establishment of the FON studio and label; Warp records and the early techno/house scene. Richard Hawley's former band, the Longpigs, also feature. The extras include previously unseen footage of Pulp at the Gotham City Club in Chesterfield (July 1985) and The Leadmill in Sheffield (September 1991). The Beat Is The Law - part 2 (TV edit): This is an extended edit of the second half of the documentary (length, 58m 56s). 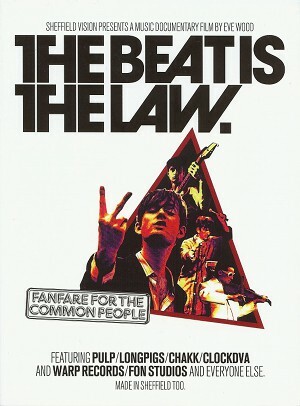 It follows on from Sheffield Vision's earlier film, The Beat Is the Law (Part One). A 24-page colour booklet is included. The original plan was to release The Beat Is the Law Part Two, covering the period from the late-80s to the mid-90s. This being a follow on to the first The Beat Is the Law documentary. This film was largely completed and previewed at the O2 Academy 2 cinema in Sheffield (Tuesday, 2nd November 2010). An edited version was broadcast on Sky Arts (Friday, 5th November 2010). In the end, however, it was decided to instead release a version centred around Pulp: this is an edit of parts 1 and 2, along with some new material. Part 2, as was originally planned (in the form of the TV edit) is now found on this release as an extra on the second DVD.